Thermistor is a temperature sensor based on change of resistance in a ceramic semiconductor. It produces a large change in resistance with a small change in temperature. Change in resistance is measured by passing a small dc current of known value and measuring the voltage drop. A thermistor is said to be NTC or negative temperature coefficient if its resistance drops with rise in temperature. A thermistor is said to be PTC or positive temperature coefficient if its resistance increases with increase in temperature. For temperature sensing applications mostly, NTC thermistors are used. While PTC thermistors are used for electric current control, as a replacement for fuses. The standard reference temperature is the the temperature at which the zero-power resistance is specified, usually 25 deg.C. The zero-power resistance is the dc resistance value of the themistor measured at a given temperature, where the power dissipated by the thermiostor is low enough so that any further increase in power will not result in more than 0.1% change in resistance. The thermistors are characterized by this resistance value. The most common zero-power resistances are 2252 ohms, 500 ohms and 10000 ohms. 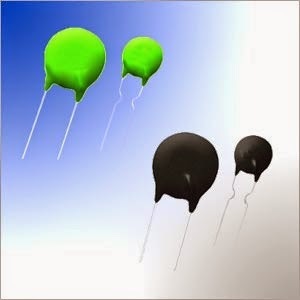 The 2252 type is the most commonly used thermistor. The maximum operating temperature is the maximum body temperature at which the thermistor will operate for an extended period of time with its response as specified in the characteristics. This temperature is the result of internal or external heating, or both, and should not exceed the maximum value specified.. The maximum power rating of a thermistor is the maximum power which a thermistor will dissipate for an extended period of time with acceptable stability of its characteristics. The dissipation constant is the ratio, (in milliwatts per degree C) at a specified ambient temperature, of a change in power dissipation in a thermistor to the resultant body temperature change. The resistance-temperature characteristic of a thermistor is the relationship between the zero-power resistance of a thermistor and its body temperature. The temperature-wattage characteristic of a thermistor is the relationship at a specified ambient temperature between the thermistor temperature and the applied steady state wattage. The current-time characteristic of a thermistor is the relationship at a specified ambient temperature between the current through a thermistor and time, upon application or interruption of voltage to it. The stability of a thermistor is the ability of a thermistor to retain specified characteristics after being subjected to designated environmental or electrical test conditions. 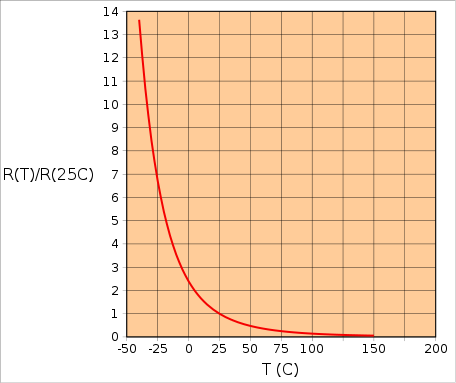 The graph below shows R-T relationship of an NTC thermistor. As its response is non-linear, it becomes difficult to design its signal conditioning circuit. To overcome this difficulty, thermistors are used in matched pairs in such a way that the non-linearities offset each other. Vendors often offer panel meters and controllers that compensate internall for thermistors' lack of linearity. Stable and not affected by aging. Requires current source to operate. Temperature compensation of Oscillators, LCD Displays, Battery charging and some amplifiers. Inrush current limiter: An NTC thermistor produces a lag in lowering its resistance when power is raised. This lag can be used to limit the surge current. Also used for level measurement. Overcurrent protection: When a fault occurs, PTC thermistor will heat up to switch from low to high resistance. As a time delay for starting motor. Battery management: When a rechargeable battery gets charged fully, it heats up. This heat is used by the PTC thermistor to switch to high resistance and saves power.